Mohanthal Recipe – Traditional Indian dessert of festivals made with gram flour or chickpea flour roasted in ghee and sweeten with sugar syrup. 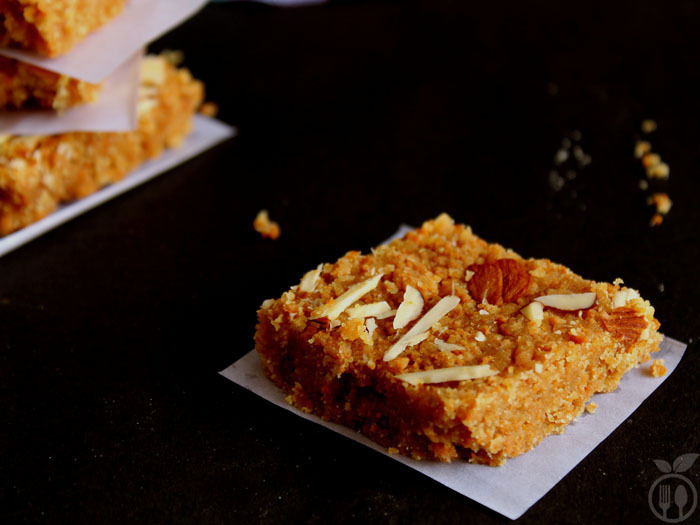 Mohanthal recipe is most popular Indian dessert always made during festivals like Diwali and Janmasthami. This recipe originates from Gujarat and Rajasthan – Western states of India. Diwali is incomplete without this recipe. As I promised, I am sharing proper authentic way to make our traditional Indian Dessert. I am very lucky that both my moms (my mother-in-law also) know the traditional methods to make our old and unique dessert of Indian culture. The Authentic Churma ladoo, Soft Sukhdi Recipe and super healthy Whole Wheat Halwa recipes are again pure authentic recipes from our old kitchens. If you want perfect result, you need to follow the instruction properly. Step by step information will help you to get best result. I am dessert lover and especially traditional dessert from all across the India. And I am so happy that I am capable of making them so perfectly that everyone in my family asks for my dessert rather than available into market. Mohanthal recipe is made from besan or gram flour or chickpea flour. Before roasting it into ghee, one important process you have to do. To make pastry, shortening process you have to do. Shortening is ant fat that is at room temperature and used to make crumby pastry or cookie dough. The same method we are using here. Not only fat in term of ghee but we are also using some milk to get more crumby texture. 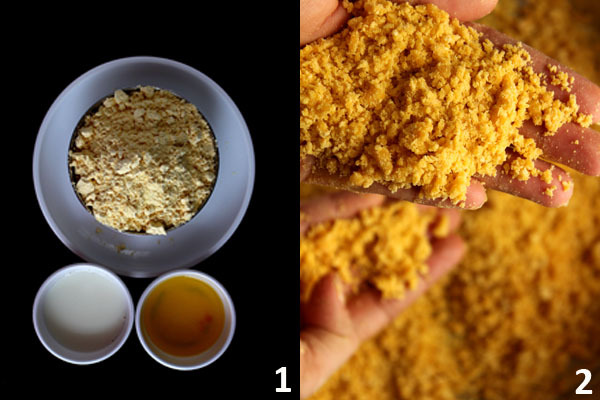 1) Simply you need to mix the ghee and milk using palms into flour and create breadcrumb like texture. 2) Then using strainer, strain the flour mixture by rubbing it though the holes of strainer. Then take the flour into deep sauce pan and ghee. 3) Now roast the mixture till it gets golden brown color. And let it cool till then prepare the sugar syrup. 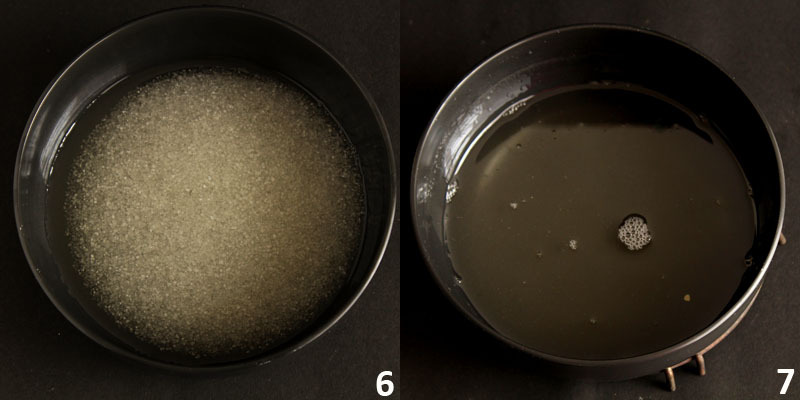 4) To make proper sugar syrup take one sauce pan and add sugar and 1/2 cup water and let it boil. Once it reaches two treads consistency, switch of the flame. When your sugar syrup gets right consistency, you will get success for making this recipe. 5) Once your sugar syrup is ready, add it into roasted flour. Keep in mind that, the flour mixture must be at room temperature. Otherwise mohanthal will get rubbery texture and hard while it cool down perfectly. You can garnish it with almond flacks or pistachio flacks and many other nuts. Saffron will also give a good color to a dish. Before roasting the flour into ghee, you need to do the process which is known as mohein in Hindi. You can also add mava into this recipe. But if you use it, you can use it for just 3-4 days. When you add sugar syrup into flour mixture, that mixture must be at room temperature. If both are hot then you will get rubbery texture of fudge. Do not store them into fridge; it rests well at room temperature. Mohanthal Recipe - Traditional Indian dessert of festivals made with gram flour or chickpea flour roasted into ghee and sweeten with sugar syrup. 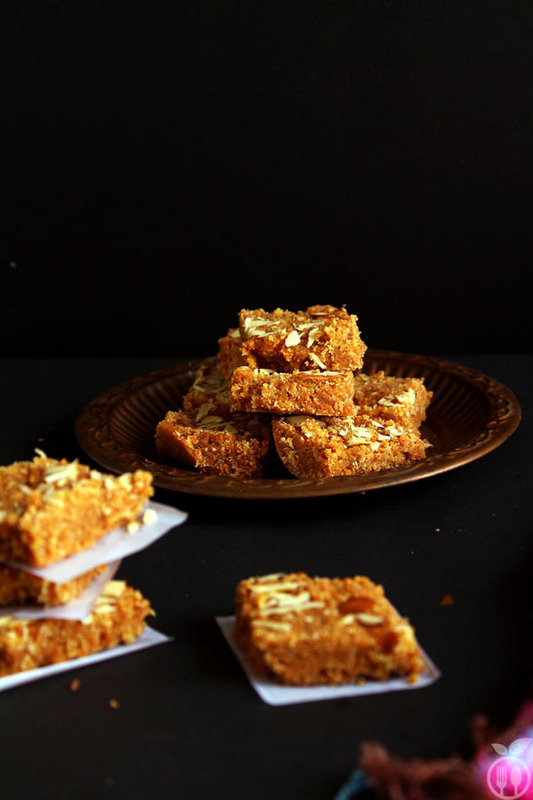 Mohanthal recipe is most popular Indian dessert always made during festivals like Diwali and Janmasthami. 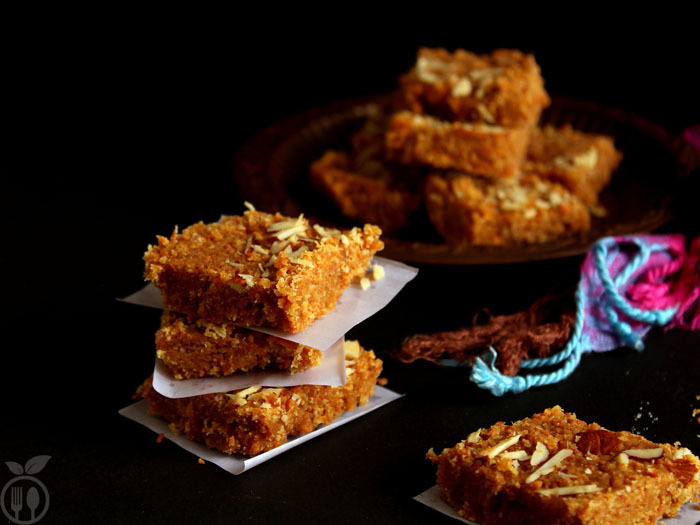 This recipe originates from Gujarat and Rajasthan - Western states of India. Diwali is incomplete without this recipe. Add ½ cup ghee into gram flour. 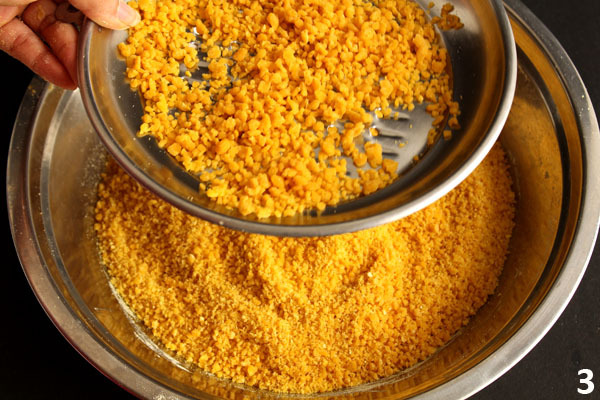 Rub the ghee well into flour and try to make some crumby texture. Then add milk 1 tbsp by 1 tbsp and again rub and make some crumby texture using your palm. Using strainer, pass the mixture form it. And you will get some breadcrumb like texture. You need to rub the mixture while you are straining it. 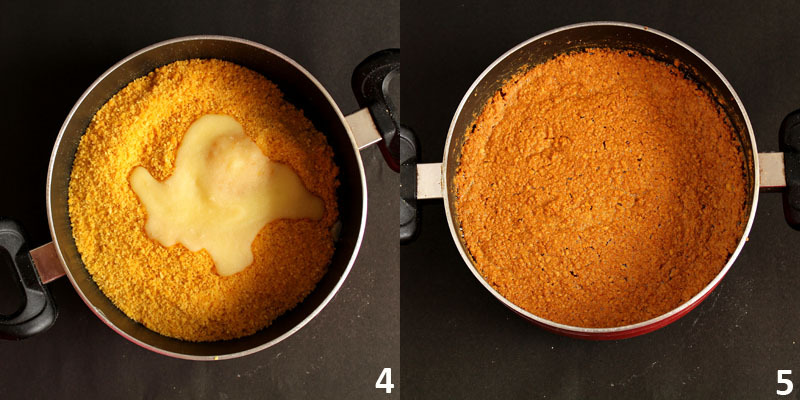 Then in deep skillet, heat the 1½ cup ghee. Add that crumby mixture and roast it into ghee for 10 minutes. Once it will get dark brown color, switch of the flame, and let it cool little bit. Again take one sauce pan and add sugar and ½ cup water and let it boil. Once it reaches two treads consistency, switch of the flame. Then add sugar syrup into roasted flour, mix it well and finally add cardamom powder immediately transfer the mixture into greased plate. And leveling the mohanthal at appropriate height. Now sprinkle the almonds flakes, and press well into fudge. Using knife cut the square pieces and let it cool. 1) You can store it into air tight container for 15 days. No need to store into fridge. Excellent recipe, sumptuous taste, very simply explained, simply awesome!